Is it me, or are smartphones getting more and more rugged without sacrificing on their aesthetic value? After all, this is exactly what has happened with the Samsung Galaxy S4 Active, not to mention the Galaxy S5 following in its steps, in addition to having the likes of a Galaxy S5 Active as well as other Xperia devices from Sony to boot. Having said that, a waterproof phone is certainly handy to carry around, especially when you need to take a photo by the pool or at the beach, or even when you go whitewater rafting. The thing is, when said smartphone runs out of juice in the middle of nowhere, a backup or portable battery would come in handy. 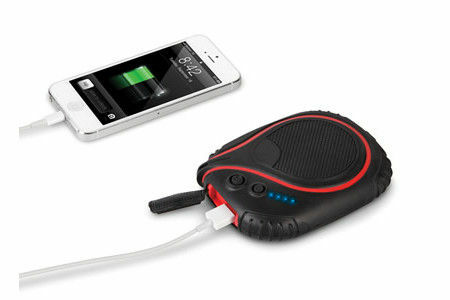 The $99.95 Waterproof Backup Battery fits the bill perfectly then in such situations. Those who use more “sensitive” devices (aka non-waterproof or water resistant) might find the Waterproof Backup Battery to not being a match. However, it will still be able to get the job done, and it would be interesting to see the Waterproof Backup Battery connected to the Galaxy S5 Active under a meter of water, charging the latter device. Now that would be a true testament to the ability of both devices’ waterproof claims, don’t you think so? The Waterproof Backup Battery works great in wet conditions thanks to a double injection-molded case and gasket-sealed interior, allowing it to achieve an Ingress Protection rating of IP67. A fully charged model would be able to recharge a smartphone three times and an iPad twice courtesy of its USB and microUSB ports.